Italy’s recession is also partly home-grown. In September 2018 its populist government unveiled budget plans for 2019 that defied the European Union’s fiscal rules. As the row with Brussels worsened, government borrowing costs rose sharply. Tensions were eventually defused in December, when the government agreed to run a smaller deficit, largely by dint of postponing its plans to increase spending. Though the spread between Italy’s government-bond yields and those of safe-haven Germany has fallen from its peak, it is still higher than it was a year ago. The instability has had an economic cost. 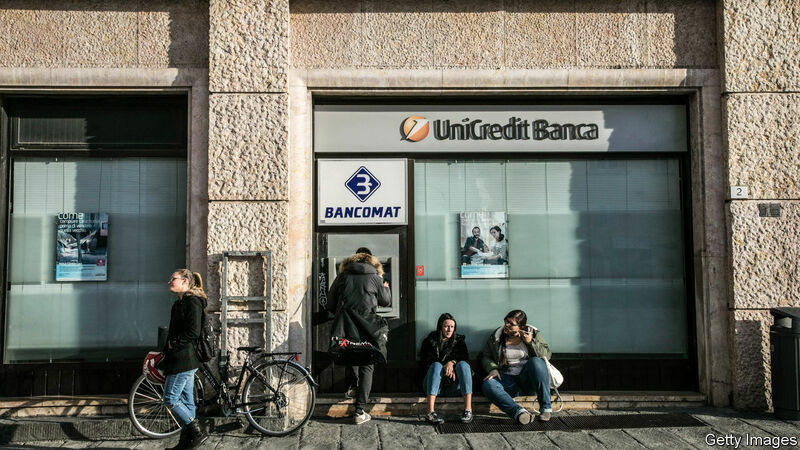 A survey of lenders by the European Central Bank (ECB) found that in the fourth quarter of 2018 Italian banks became more fussy about whom they lent to, even as credit standards in other large euro-zone countries eased. That could reflect rising funding costs. The Bank of Italy, the national central bank, expects that rises in sovereign-bond yields will push Italian companies’ borrowing costs up by a percentage point over the next three years. Olivier Blanchard and Jeromin Zettelmeyer of the Peterson Institute for International Economics, a think-tank, estimated in October that such financial-market effects would probably offset the boost from the government’s fiscal measures. These domestic and external forces have similar economic effects, notes Nicola Nobile of Oxford Economics, a consultancy. They shake businesses’ and households’ confidence, leading them to delay spending. Measures of sentiment have weakened. The Bank of Italy notes that the share of firms expecting to increase investment in 2019 has fallen. Economists have marked down their forecasts for GDP growth in 2019. The IMF expects growth of 0.6% in 2019, down from its forecast of 1% in October. Mr Nobile and Ms Giani have plumped for a more gloomy 0.2-0.3%. ECB-watchers think that the bank may extend its targeted long-term refinancing operations. The scheme, which offers banks cheap funding in return for lending to firms and households, could help ease credit conditions in Italy. Beyond that, policy options are limited. The ECB will inject further stimulus only in the event of a wider slowdown, rather than one confined to Italy. 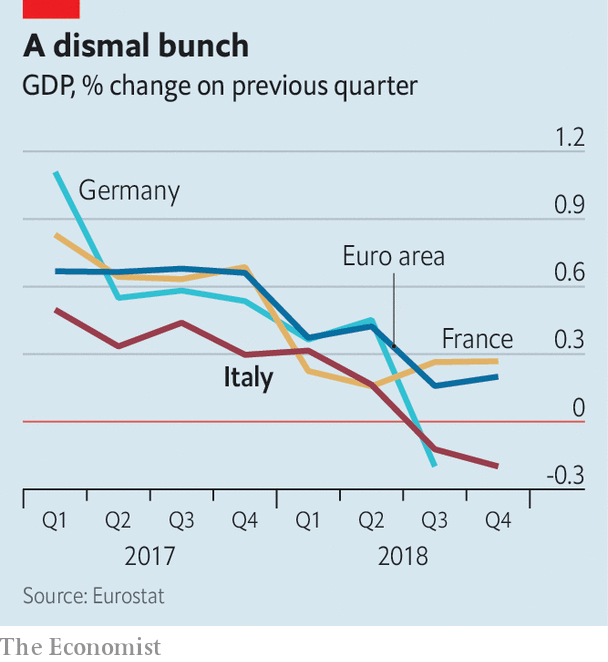 And anyway, any easing might be too little to counter Italy’s deeper slump. Italy’s government now finds itself hemmed in. Economic weakness worsens its fiscal position. Public debt, already 132% of GDP, could rise further. The budget deficit will probably exceed the government’s target of 2% of GDP. That worse fiscal position could, in turn, make it harder for the government to stimulate the economy. If the European Commission decides Italy has broken its fiscal rules, any further spending will cause another row. And last year’s episode showed that big spending plans can be self-defeating if financial markets are spooked. Italy’s government would need to convince both Brussels and investors that extra spending would help the economy grow. Until then Italy will stagger on.